It’s safe to say that the ad campaign for director Gareth Edwards’ Godzilla reboot sold an apocalyptic product that seemed to be in line with the grim n’ gritty, death n’ destruction blockbusters that are en vogue these days. From the previews, you’d expect an origin story in which we see Godzilla’s parents murdered by an evil skyscraper, giving him grounds for revenge against said architecture. In a sign that Edwards did more than simply browse through a toy catalogue, Godzilla truly honors the optimistic, fun nature of the franchise. 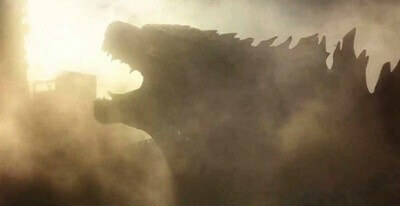 Without giving too much away, considering you’d never get the impression from the trailers, you actually get to cheer for the portly King of the Monsters before all is said and done. The humans, however, earn little more than a polite golf clap. The film opens in the late 90s. Joe Brody (Bryan Cranston) and his wife, Sandra (Juliette Binoche), are investigating bizarre seismic readings at the nuclear reactor, where they work. Things do not go well. The nuclear station goes kablooey, Sandra is killed and Joe spends the next 15 years trying to get to the bottom of what really happened. Cut to the present day and Joe’s son, Ford (Aaron Taylor-Johnson), returns home to San Francisco from serving overseas and immediately has to head to Japan to spring his father from jail. If you don’t enjoy the second half of Godzilla, why did you go see Godzilla? It’s nothing but monster-on-monster mayhem in which Godzilla uses some kind of kaiju krav maga against the Massive Unidentified Terrestrial Organism (or M.U.T.O.S.). It’s the rest of the movie that has issues. Most notably, the film has earned the dreaded “failure to appropriately use Elizabeth Olsen” award, which comes with an automatic loss of a full letter grade. Taylor-Johnson is fine, but when the rest of the cast is nothing but uber-good actors and actresses, he looks second rate. This is to say, good luck developing a bond with any of these nondescript, ambiguous non-characters. If it was Edwards’ intent to have Godzilla, a creature that doesn’t speak, be the most interesting character in the film, he pulls it off. In the end, Godzilla gives us Godzilla as Godzilla should be: it’s grand, goofy entertainment that compensates for crappy characters with optimism and sizzling summertime spectacle.